Yesterday, Minnesota placed winger Eric Nystrom on waivers. The Wild clearly wanted to move his $1.4 million salary, and any player picked up on waivers gets split between his old and new teams. So at a more palatable $700,000...there were still no takers for Nystrom. Today, Dallas traded for Nystrom and his full $1.4 million salary, giving up a bag of pucks in return. In the NHL, sometimes it makes sense to pay double the asking price. It's all because of the salary floor, a logical measure to promote parity that still leads to odd situations like this one. Every NHL team must have at least an annual payroll of $48.3 million. That's not a problem for most, but the Stars are going through bankruptcy and want to stay as close to that number as possible. Now they're below it, thanks to forces beyond their control. Dallas is still paying Sean Avery $1.9 million this season—half of his salary because he was waived and claimed by New York years ago. With that $1.9 million gone, Dallas fell $1.2 million below the salary floor. So claiming Nystrom on waivers at a $700,000 hit would not have closed the gap. But trading for him at his full salary does the job nicely. It took a number of quirks of the waiver process to force this situation, but at least Eric Nystrom has a job in the NHL. 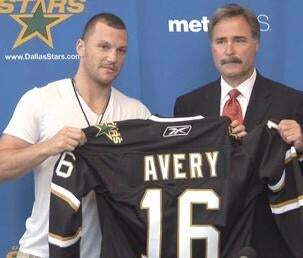 Sean Avery, alas, rots away in Hartford. He was told there would be no math.